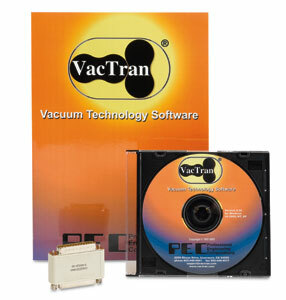 Professional Engineering Computations introduced VacTran vacuum calculation software some 18 years ago. The current version, VacTran 3, both continues the traditional calculations and siginificantly advances the program's capabilities. As the pressure decreases during the pump down of any vacuum vessel, the flow regimes through chamber and ducts change from continuum, through transitional, to molecular flow. As the flow changes so do formulas for conductances and pumping speeds. Further complicating this picture is the outgassing rates of various materials which decay exponentially with time. Modeling these interactions, even with a spreadsheet doing the math, is tedious and rarely attempted. VacTran 3is a fast, convenient way to perform a variety of calculations at the 'what-if' design stage to investigate and maximize a vacuum system's performance. Our extensive practical experience (almost daily use for 17 years) with all versions of the VacTran program have convinced us of its practicality and utility for vacuum system modeling. Current VacTran users with version 2 that have parallel port (LPT1) keys can upgrade to version 3 (with USB key) by directly contacting sales@vactran.com. KJLC does not supply this upgrade. VacTran 3: Digital Alphanumeric Key VT-3S P.O.R.